The title is a structuring element to separate different sections of the page. The heading levels range from 1 to 6, by decreasing importance. This does not affect their appearance, but it can be taken into account by some search engines. 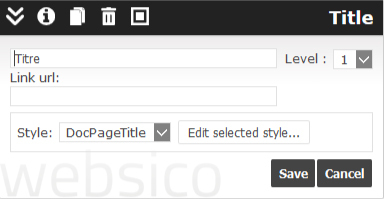 The default value is 2, you should reserve 1 for the main title of the page. The title may be used to indicate a significant link, or to build a menu manually, for example. The link then takes the entire width allocated to that item.